I’m cooking with Blue Apron this week before we buckle back down on our nutrition before our vacation. Not that Blue Apron isn’t healthy. Check out what is on this week’s menu. I always go in and check out what’s on the menu at Blue Apron to see if I want to schedule or skip my delivery. They usually show 4 weeks of menus at a time so you can plan ahead. I do believe Blue Apron meals are mostly healthy. You get fresh vegetables and lean meats. The wholesomeness of the carbs depends on the recipe. Sometimes the amount of fats from cream and cheese can be a little high if you’re doing a workout program that is strict with nutrition. They’ve even started offering Whole30 Recipes if you’re going that route. Check out my Blue Apron Review here. 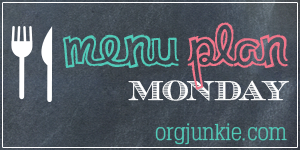 Be sure to subscribe to What’s Working Here to get my Weekly Menus delivered right to your inbox PLUS bonus tips and reviews of new recipes we’ve tried. I’ve been thinking of trying Blue Apron. What are your favorite recipes? The Chicken Tetrazzini we had tonight was delicious! The Barramundi dishes we’ve had are amazing and the Miso-butter Salmon & Lo Mein Noodles.